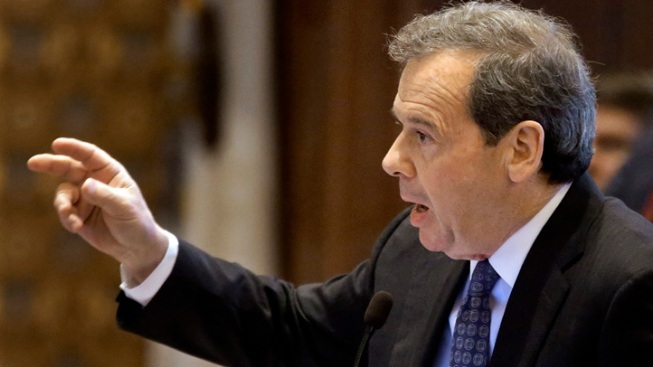 Senate President John Cullerton is proposing legislation to freeze property taxes for two years and overhaul the way Illinois funds schools. The measure introduced Tuesday also would require the state to make the employer contribution for Chicago Public Schools' teacher pensions. Currently Chicago taxpayers cover those costs. Spokeswoman Rikeesha Phelon says the bill is the Chicago Democrat's attempt to acknowledge requests from Republican Gov. Bruce Rauner, who's repeatedly called for freezing property taxes. But Rauner is likely to reject the measure. He wants a freeze to be accompanied by a provision to allow local governments to opt out of collective bargaining with public-employee unions and wage requirements for public construction projects. Cullerton's bill doesn't include those items. The measure is scheduled for a hearing Wednesday.